Cerium-activated Cs2LiYCl6(CLYC) is a an excellent dual-mode neutron-gamma radiation detector. With a gamma energy resolution of better than 4.5%, a high cross-section for thermal neutrons when 95% 6Li-enrichment is used, and pulse shape discrimination (PSD) of 2.6, it is a promising replacement for medium resolution gamma-ray detectors and 3He tubes. These scintillators can also be enriched with 7Li and used for fast-neutron detection. 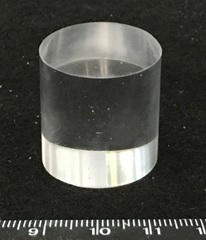 CapeSym's proprietary crystal growth process is now routinely producing 1.5-inch diameter crystals. Scale up to larger diameter crystals is in progress. - 1 in. diameter x 1 in. - 1.5 in. diameter x 1.5 in. Cuboids and other custom sizes are available, bare or encapsulated, with or without coupling to a PMT. Contact us at sales@capesym.com for pricing and availability.